Arbutus Ridge Golf Club is the recipient of this year’s Tourism Vancouver Island Employer of the Year Award, sponsored by go2HR, which recognizes a tourism business that exemplifies best practices in all areas of operations and human resource management. Arbutus Ridge Golf Club was selected as the recipient of the 2017 Employer of the Year Award for the exceptional leadership and quality of workplace that is provided. The success stories of employees who advanced their roles and achieved new accreditations while at Arbutus Ridge is an important factor in this award. Arbutus Ridge is actively involved in community outreach through supporting local charities and donations, and survey results confirm the positive corporate culture that is reflected in the organization. “Arbutus Ridge Golf Club is honoured to win this prestigious award. It is our belief that if we take as much care of our Team Members as we do the paying guests and members, our business will not only be successful but also be a fun, motivational and rewarding place to work,” says General Manager Richard Ingle. “We are fortunate to serve people from all over the world who are vacationing on beautiful Vancouver Island. With that comes a duty to represent our game, our brand and our Island to ensure that visitors go home and tell stories of how amazing Vancouver Island is as a holiday destination. Our Team thrives on this responsibility and I am so proud of all of them,” Ingle adds. The Arbutus Ridge Golf Club is located in the seaside community of Cobble Hill, a 25-minute drive from the outskirts of Victoria and 15 minutes from the cultural city of Duncan. 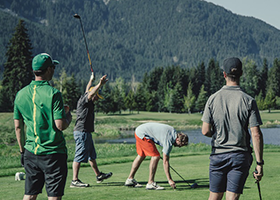 The Bill Robinson design 18-hole golf course is rated Four Stars by Golf Digest, Best Destination Golf Course in British Columbia by Golf Nerve Magazine and One of Canada’s Ten Best Courses for Your Money by Westjet Magazine. The facility has played host to numerous provincial and national championships and achieved a Sustainability Award from Tourism Vancouver Island. Open year-round, the golf course and clubhouse are specifically designed to offer some of the most stunning views on Vancouver Island amongst the characteristic Arbutus tree. The back nine climbs a ridge to overlook the Satellite Channel where you will find the Satellite Bar & Grille including wrap around patio and ocean views. The Mount Baker room provides panoramic views and is one of the most desired Wedding, Meeting and Banquet facilities on Vancouver Island. The GBC Golf Academy showcases a full length practice facility with five target greens and two short game areas. Arbutus Ridge is also complemented by three indoor tennis courts. Arbutus Ridge Golf Club is owned and operated by the GolfBC Group. In photo: Arlene Keis (go2HR, Sponsor), presents award to Arbutus Ridge Golf Club, with (left to right) Andy Hajer, Richard Ingle, and Mike Brown accepting.